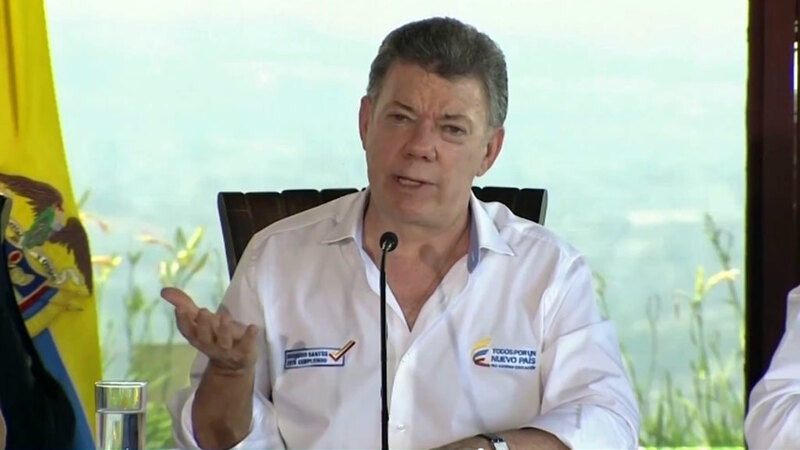 Colombia President Juan Manuel Santos on Saturday praised the United States government for appointing top official Bernie Aronson the North American country’s envoy to peace talks with rebel group FARC. The United States has been passively and actively involved in Colombia’s armed conflict between leftist rebels and the state for decades, and on Friday announced to step up its role in the peace talks that began in November 2012. US President Barack Obama appointed an envoy of the “highest category,” Santos said at a cabinet meeting in Dosquebradas, a town in Colombia’s iconic coffee region. The Colombian president stressed Aronson’s political weight as former assistant secretary of state, leading the Inter-American Affairs department. The new US envoy “has experiences in peace negotiations because he directly took part in the peace talks in El Salvador” that suffered a civil war between 1980 and 1992. Aronson’s experience makes him a “luxury” choice to be Washington’s representative in the talks. “The United States government uses this figure [of a special envoy] on very rare occasions, making this a very important signal” that demonstrates how Washington considers a positive outcome to the talks important, said Santos. The FARC, which has been fighting the Colombian state since 1964, said Friday it welcomed Aronson’s appointment. “Mr. Kerry said that this decision follows a request made to him by President Juan Manuel Santos last December, for the United States to take “a more direct role in the peace process”, which we believe is a necessity,” said the FARC. Washington’s direct involvement in important, “considering the permanent presence and impact by the US in Colombia’s political, economic and social life; they may now be able to contribute to the establishment of social justice, true democracy and the overcoming of inequality and poverty, which is the way to open the true doors to peace,” according to the guerrillas. The US has played an active part in Latin American affairs since the 19th century. In 1823, US President James Monroe introduced an eponymous doctrine which asserted that the US military would militarily intervene in any perceived attempt by a European country to “interfere” in Latin America. During the Cold War, US foreign policy in Latin America shifted toward the stated goal of stopping the spread of communism, a policy known as “containment” to which became central to US national security doctrine. Under the pretext of fighting communism, the US supported right-wing military dictators and the coup d’etats which put many of them in power across the continent. In Colombia, the US provided assistance to counter-insurgency efforts starting in the 1950s against Liberal and communist guerrillas. Much of the military training and equipment provided by the US to Colombia over the next half-century became part of the “War on Drugs.” A good portion of that assistance, however, was also used as part of the conflict with insurgent groups like the FARC. In 1999, the US approved a security aid package known as Plan Colombia which was aimed at aiding the Colombian government’s fight against drugs and leftist guerrilla groups. Billions of dollars in aid were subsequently provided. Critics of the aid package and US military cooperation with Colombia have argued that the assistance has only exacerbated violence in the country. While significant advances were made against cocaine cultivation, and leftist guerrillas have been beaten back from their positions since the 1990s, massive human rights abuses, state-sponsored mass murder, and widespread violence against human rights defenders and community activists occurred during Plan Colombia. One paper put forward by academics at New York University and Columbia University has even argued that US bases and military assistance have had negative effects on the democratic process and increased paramilitary violence while having no effect on guerrilla attacks. US military training of Colombian forces has been so extensive that the Colombian military itself has become an “exporter” of security training throughout the continent.